XP Power released four new series of external/desktop power supplies that meet the latest level VI and CoC Tier 2 green standards. 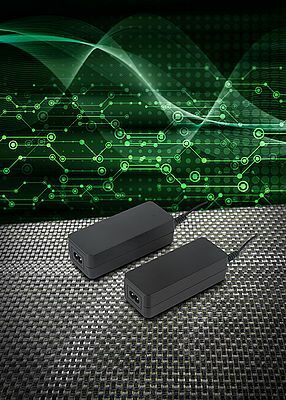 The single output power supplies are perfect for customers requiring a low power, external, 18, 24, 30 or 36W power source for their new designs that need to meet current legislation aimed at increasing energy efficiency and reducing no load power consumption. The VET18, VET24, VET30 and VET36 ranges feature a high average efficiency of up to 87% typical, measured at 25, 50, 75 and 100% load conditions. Accordingly, they meet the requirements from the Department of Energy (DoE) in the US and the Code of Conduct (CoC) Tier 2 in the EU. These standards set limits for average energy efficiency and no load power consumption. The new requirement lowers the no load power to less than 0.075W for the 6-36W output power level. The VET series power supplies all feature a no load input power of <0.075W, thus meeting the new requirements. Less power is consumed when the end unit is off, or not connected to the power source. In all four VET series power ranges, output models of 12, 15, 18 and 24VDC single outputs are available, these being the most common output voltages to suit most applications. Additionally, the VET18 series includes a 9VDC model. Able to operate over a wide temperature range of 0 to +60 degrees C with full power to +40 degrees C (+45 degrees C derating for VET36), the VET series will easily operate in most environments. All models have ITE 60950-1 safety approval and meet Class B limits for both conducted and radiated emissions. They form part of XP Power’s low cost V-brand series, offering a less expensive option for cost sensitive applications. The desktop power supplies feature an IEC input connector. An output cable is fitted with a barrel jack having 2.5mm inner and 5.5mm outer diameter ‘standard’ dimensions. The VET range from XP Power will find favour with users in many industry areas including automation and process control, broadcast, fixed telecom, instrumentation, networking/datacom/computing, mobile comms and specialist equipment. Compared to the competition, XP Power’s VET18, VET24, VET30 and VET36 series power supplies feature very high efficiencies, they are competitively priced and are available now. In addition to meeting the current efficiency requirements, the VET ranges require less energy while operating and in standby mode to help reduce the impact on the environment and save money on energy costs. The series are available from Digi-Key, element14, Farnell, RS Components, approved regional distributors, or direct from XP Power and come with a 3-year warranty.